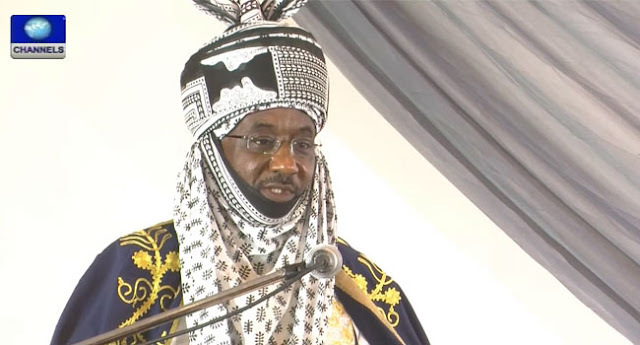 The Emir of Kano, Alhaji Muhammadu Sanusi II, on Monday, said he was not keeping a 15-year old girl said to have been converted to Islam. Sanusi made the clarification while addressing a news conference in Kano. The monarch, who described the story as mischievous and baseless, said it was intended to tarnish the image of the Emirate. “I was surprised that BBC called me from South Africa to know my side of the story, which was crafted to tarnish the image of Emirate Council and Islam. “In Aug. 2015, the District Head of Kura came to the palace with a Young Girl of about 15 years. “We were told that she was married to him after she was converted to Islam,” Sanusi said. He said he ordered her immediate return to her parents who were said to be in Bayelsa State. “I also ordered the Kano State Shariah Commission to liaise with the Assistant Inspector General (AIG) Zone 1, to Assist in taking her back to her parents in Bayelsa through the AIG who oversees Bayelsa axis, for her safety”, he said. He said he solicited the intervention of the Police because the girl was said to have made a statement that she was afraid that her parents could harm her. “In Islam, she has no right to just go ahead and decide things for herself. She is still young. “She is not mature enough. And nowhere in Islam where such a young girl can just make up her mind and give her hands in marriage just like that. It is not permitted in Islam. “That is why we said she must be taken back to her parents,” Sanusi said. He said he was surprised to hear that he was still keeping her in his custody. “This is injustice of the highest order,” he said. Meanwhile, the police have Invited Yinusa, the alleged abductor of Ese Oruru, and the members of the Sharia Council, Kano to assist with the investigation into the forceful conversion of the girl into Islam. The police spokesperson, Olabisi Kolawole, said the men were invited by the police to shed light on their roles in the abduction and forceful marriage of the 14-year old girl. When asked the number of those invited, Kolawole said she did not have the figure.